A study at the Texas A&M University found a significant relationship between dietary cholesterol and loss of strength. It was found that the lower the cholesterol levels the less muscle tissue was formed after an exercise program. Easy to state the results: The more cholesterol you eat, the stronger you become! More than that, recent headlines shouted: Anti-cholesterol drugs do not reduce heart attacks or strokes and are involved in the causation of cancer! How much evidence do you need before you stop using these dangerous drugs that are shortening your life without any benefit except to the drug companies who make them? This is one more reason you may want to think about ordering your first bottle of Cardio Advantage Plus. 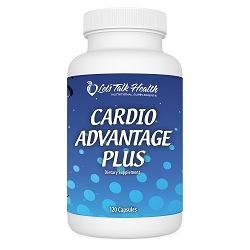 Cardiovascular disease is still a leading cause of death in America and you have the best natural prevention available in Cardio Advantage Plus. Nattokinase has been shown to support normal blood pressure, dissolve blood clots and prevent them from forming in the first place! Nattokinase is a potent fibrinolytic (anti-clotting) enzyme complex extracted and highly purified from a traditional Japanese food called Natto. Natto is a fermented cheese-like food that has been used in Japanese culture for more than 1,000 years for its popular taste, and as a folk remedy for heart and vascular diseases. Research has shown that Nattokinase supports the body in breaking up and dissolving the unhealthy coagulation of blood. In fact, it has been shown to have four times greater fibrinolytic activity than plasmin. And guess what? It happens to be another key ingredient in our Cardio Advantage Plus. We also offer the highest activity Nattokinase available separately as well.